The Roland DEP-5 is a versatile effect unit that features Non-linear Reverb (Gate Reverb) and Delay effects as well as Reverb and Chorus. Moreover, using the Algorithm function, these effects can be spontaneously combined creating subtle effects. Reverb can be obtained in the Non-linear mode. The Digital Chorus creates more natural chorus effect than the analog chorus. The maximum delay time of the Roland DEP-5 is 2000ms. Up to 99 different effect settings can be written into memory. Three Band Digital Equalizer is built in. Featuring MIDI Connectors, the Roland DEP-5 can be set up with other MIDI device. The Program Change message sent from the external device. can select the effect sening on the Roland DEP-5. 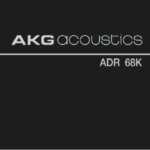 80db and total harmonic distortion of under 0.03%.